We all know that VR has its place in education. But this project makes it really meta: Teaching teachers to be better teachers. I’ve written previously about a Greek startup that wanted to use virtual reality to provide job candidates with a chance to test their mettle in ‘real’ environments during the recruitment process. Similarly, a British startup is using virtual reality to help people with speech delivery. And there's the American startup that’s using VR to help surgeons practice before going onto the real thing. They’re examples of how a technology that seemed destined for the margins is slowly finding a use case. A team from the University of Virginia has developed a VR-based classroom to allow teachers to receive instant feedback on their delivery and classroom management. 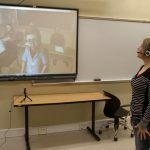 The virtual environment allows the teacher to deliver a 10-minute session to a virtual class via a small studio space whereby they deliver their lesson to a video monitor. During the session, the ‘students’ provide a range of engagement and behaviors, to which the teacher is expected to respond. The environment is designed to test the teacher out, so a ‘student’ might provide some unhelpful input, either to the teacher themselves or to a peer. They may even start playing on their phone or something equally disruptive. Of course, this kind of teach and respond learning is already available in real classrooms with real pupils, but the team believes the tool remains valuable. For instance, they suggest that it provides an instantaneous feedback mechanism that is often missing from real classrooms, especially when the feedback is from supervisors. “The simulator provides an opportunity for students to get guided practice and on-the-spot feedback on their use of different strategies used in the classroom,” they say. It also offers the teachers a chance to try out some different approaches and strategies in a relatively safe environment. This offers a marked improvement over sitting in on classes of teachers who have been in the game for years. Learning from a ‘rawer’ environment is often better than joining a well-oiled machine. “These simulation experiences are low-risk opportunities to practice essential professional skills to a level of fluency, which ultimately enables students to move into professional practice with ‘experience’ already under their belts,” the team says. By delivering almost instantaneous feedback, the team hopes that it provides a great learning environment outside of what can be a psychologically stressful environment. By discussing the class in real-time, the authors have witnessed a big increase in self-awareness among the participants. They hope to build upon this early success before expanding its use across other professions, including psychology and counseling. It’s certainly an interesting trend to keep on top of.